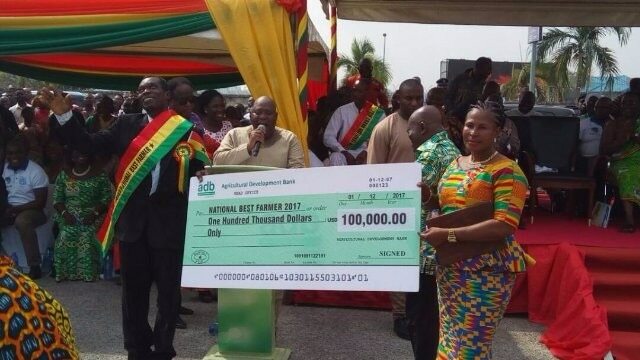 A 50-year-old farmer from Dormaa West in the Brong Ahafo Region, Philip Kweku Agyemang has been adjudged the 2017 national best farmer in Ghana. He becomes the first to walk away with $100,000 cash prize. Mr. Agyeman who has been farming for 28 years has farms that employ 205 workers, both casual and permanent. The first runner-up is Mabel Akoto Kudjoe from Hohoe in the Volta region while the second runner-up is Rebecca Anne Commey from the Greater Accra region. In all, 77 farmers and fishermen were recognised for their hard work. The president, Nana Akufo-Addo who gave the keynote address at the 33rd Farmers’ Day celebration in Kumasi on December 1, 2017 said that in line with the government’s target of promoting all-year-round cropping, 320 small dams and dugout in 64 districts in the Northern Region have been earmarked to be developed under the One-Village-One-Dam project. Chiefs have also been urged to establish their own farms to support the Akufo-Addo government’s Planting for Food and Jobs programme. PRESIDENT AKUFO-ADDO, BUILD ON MAHAMA'S ACHIEVEMENTS. THE CAMPAIGN SEASON IS OVER..